By 9:30 a.m. it is already more than 90°F, and the inappropriately chirpy voice on the radio tells us that we are heading for a "heat factor" of 108° today. It is going to be a dog day afternoon in Manhattan. The traffic slowly snakes beside the Hudson River until the unlikely sight of a moored aircraft carrier looms into view ahead. This is the USS Intrepid, a WWII Essex Class carrier that was recommissioned as a modern angle-deck vessel in 1954. This involved reconfiguration and fitting with steam catapults. 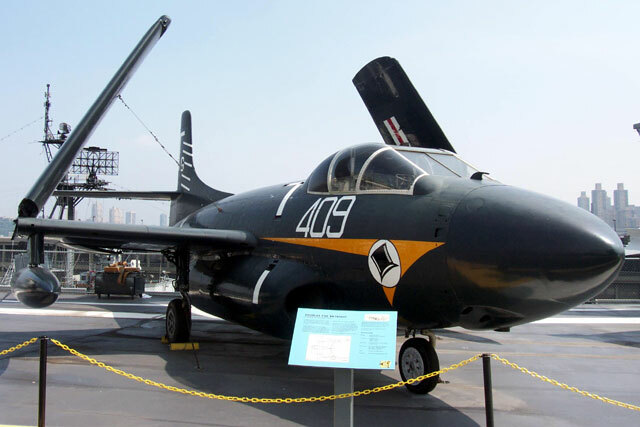 In 1982, the Intrepid was rescued from the scrap yard and moved to the Hudson River to begin its new life as a floating aviation and aerospace museum. This historically significant carrier is joined at its mooring by the first guided-missile submarine, the Growler; and the Destroyer, USS Edson. 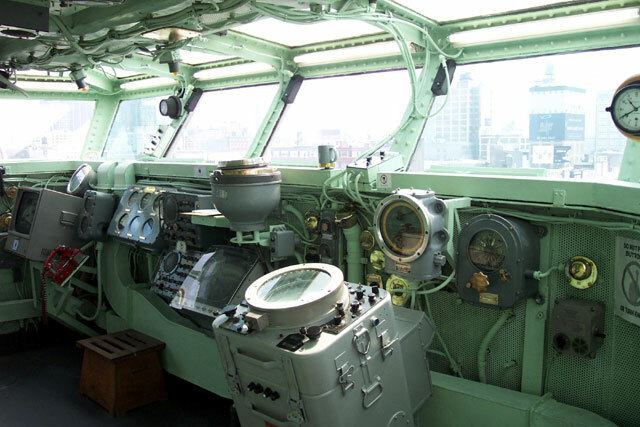 Exhibits on the Intrepid are many and varied. The hangar deck contains an A-4B Skyhawk, and Avenger, Hellcat, a replica Helldiver and much more. Visitors may conduct their own audio-guided tour of the other features of the aircraft carrier, including the bridge, the Captains cabin, the radio room and the Combat Information Centre. The day is blistering by the time we venture onto the flight deck, but there are plenty of distractions from the heat. 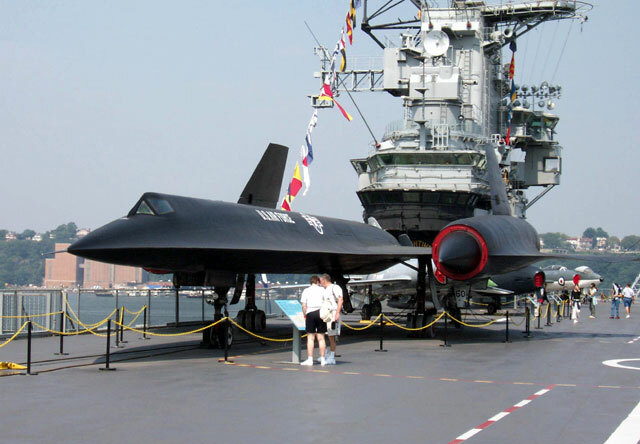 The biggest surprise, in every sense of the word, is an SR-71 Blackbird parked near the bow. Now there is a carrier take-off I would like to see! The other incongruities are an F-16A and a MiG-21. 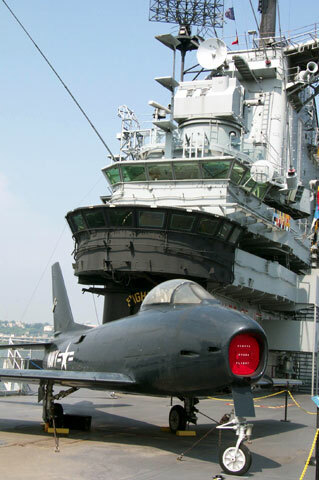 Most of the remaining exhibits look more at home on the deck, including a Phantom, a Crusader II, A Corsair II, the F-14B Super Tomcat, and some very cool examples of 1950s aviation technology from both sides of the Atlantic - a Supermarine Scimitar, a Fury, Sky Warrior, Vigilante, Sky Knight, two F-11s. The list goes on. All the exhibits are clean and well maintained, with barriers providing a good close-up view of the subjects. My thanks to Steven Eisenman and family for their hospitality during my New York visit..